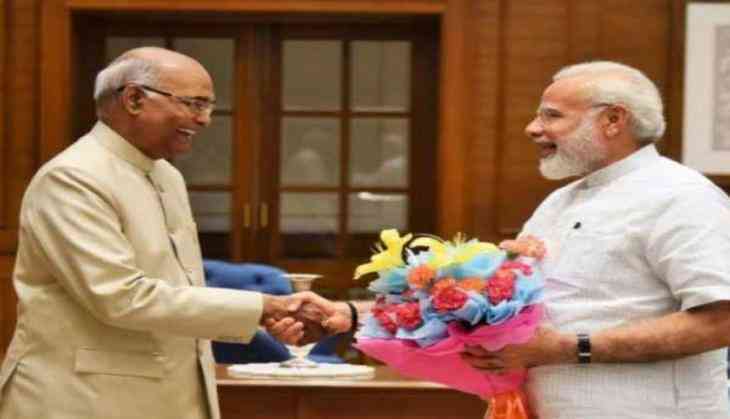 Prime Minister Narendra Modi on 25 July congratulated President Ram Nath Kovind after he was sworn in as the 14th President of India. Prime Minister Modi took to Twitter to express his happiness, "Congratulations to Shri Ram Nath Kovind ji on taking oath as the President of India. @RashtrapatiBhvn". Prime Minister Modi also hailed President Kovind's inaugural address as 'inspiring'. "Very inspiring address by President Ram Nath Kovind Ji, which beautifully summed up the essence of India's strengths, democracy and diversity". Very inspiring address by President Ram Nath Kovind Ji, which beautifully summed up the essence of India’s strengths, democracy & diversity. On addressing the gathering at Central as President of India, Ram Nath Kovind said, "I thank you for electing me to the responsibility of the President of India, and I enter this office with all humility. I have been a Member of Parliament and here, in this very Central Hall, have had discussions with many of you. Often we agreed, sometimes we disagreed. But we learnt to respect each other. And that is the beauty of democracy". He added that India believes in philosophy of 'World is one family', adding there is a lot to be achieved. "We have to take India to great heights. I feel privileged to walk on the same path as Dr. Radhakrishnan, Dr. Abdul Kalam and Pranab da," the President said. He also asserted that a nation grows when the development for all is ensured. Kovind was elected the President last Thursday as a ruling NDA candidate. He defeated the Opposition parties' nominee Meira Kumar by a huge margin. President Kovind was administered the oath of office and secrecy by Chief Justice of India J S Khehar. Ramnath Kovind's family members, associates and close friends arrived for the swearing-in at Parliament House. Earlier in the day, Kovind reached Rajghat and paid tribute to the Father of the Nation, Mahatma Gandhi along with wife Savita. At the Parliament, both were received by Vice-President Hamid Ansari, Prime Minister Narendra Modi and Speaker Sumitra Mahajan.